The horror genre is making a comeback where intelligent and creative entries are concerned. “A Quiet Place” is the sophomore directorial effort from actor John Krasinski who also stars in the film. It’s a swift horror film that earns genuinely terrifying moments, never getting bogged down in the details of the story. Blunt’s performance is among the film’s highlights, as she internalizes fear and uses silent expression to deliver another memorable performance. Elements of this dystopian horror film feeling similar to “Z for Zachariah” (opening in a ransacked convenience store) or even “Alien” (creatures movements) are suppressed and the showcase is on the peculiar necessity of being quiet. At day 89, The Abbott family suffer tragic loss that forever change their tight knit dynamic. Over a year later the family of four have settled into a farm where they have orchestrated a new way of life. Deadly mysterious creatures have taken out much of the population, they respond only to sound, the only way to survive is to be quiet. Bare feet, sandy paths, living underground, and discarding anything that makes noise is paramount. Lee (Krasinski) struggles to keep his family safe, working to find the creatures weakness, with no outside communication from the rest of the world. The Abbott family are completely on their own, living in fear every day. Evelyn (Blunt) is pregnant, and the family has a plan in place for when the due date arrives. Horror films sometimes solely depend on sound to carry out jump scares or music to increase tension. The majority of “A Quiet Place” is silent (uncomfortably silent, don’t be the guy eating popcorn silent) and there is very little dialogue outside of sign language. Thankfully the score by Marco Beltrami (“World War Z”) doesn’t overcompensate. Instead the sparse music’s most resonate notes are in the tender moments, not those of suspense. Silence is proven more unnerving that loud sounds here, and I can’t remember a time where a packed theater has remained so mute. “A Quiet Place” runs at 90 minutes and doesn’t waste a second. 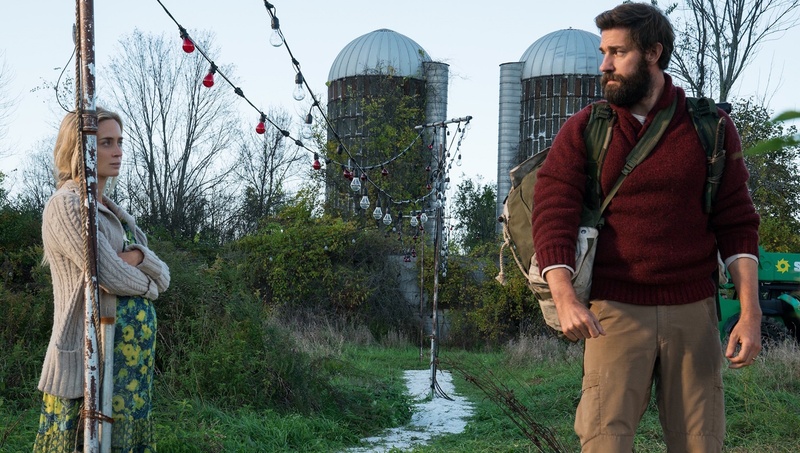 The film won’t end where audiences expect, but Krasinski has molded a horror movie that will remain one of the year’s most evocative. Supporting performances from Jupe (“Wonder”) who has the natural advantage of appearing permanently terrified and Millicent Simmonds (“Wonderstruck”) add to the overall appeal. Yet it’s Blunt (accompanied by familiar “Sicario” sounds in early moments) who performs the film’s most terrifying sequence mid film. Her silent performance is deafening with articulation, those silent screams will be burn into your memory. Krasinski’s performance is the weakest link among the actors, but his direction is more impressive than first feature “The Hollars”. Another plus for A Quiet Place’s is moving so quickly it doesn’t allow time to pick apart the plot. Intelligent enough to attract audiences outside the genre, but thoroughly frightening. A solid terrifying horror film that’s well acted and speedy.